What comes to your mind when you hear Mayonnaise? A tasty white dip which can complement any snack? A burger? Momos? Or a Sandwich? No matter what comes to your mind after hearing Mayonnaise, we are certain about one thing and that is the fact that your mouth will start watering after hearing Mayonnaise. There are several brands in India which manufacture and markets this tasty dip and each of us has a personal choice. 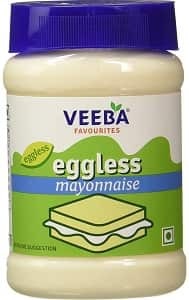 Moreover, there are mayonnaise which are made in the traditional way with eggs and then there are also many brands which have eggless veg mayo. Most of the brands have also bought in some customization to the Mayonnaise by adding flavours to it. For example, you will find Mint Mayonnaise, Chipotle Mayonnaise, Tomato Mayonnaise, Herb Mayonnaise and many other alterations from the original flavour. You can try different brands as each brand has a distinct flavour and you can also go ahead and check out the different flavours available in the brand. You will find a perfect dip, sandwich dressing or even a salad dressing as Mayonnaise can enhance the flavour of anything that you love. Today, in this space, we have listed the top 10 best Mayonnaise Brands available in India. You can surely go ahead and check out the variations and different flavours available in these brands. So, here is the list. 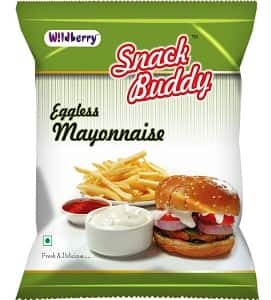 If you are looking for a veg mayo that is not very expensive then you must try the one from Snack Buddy. The Mayonnaise is not expensive and at the same time, you will find a big package in this as well. The company is known for manufacturing vegetarian eggless version of Mayonnaise which basically uses a high quality soya oil for emulsification. 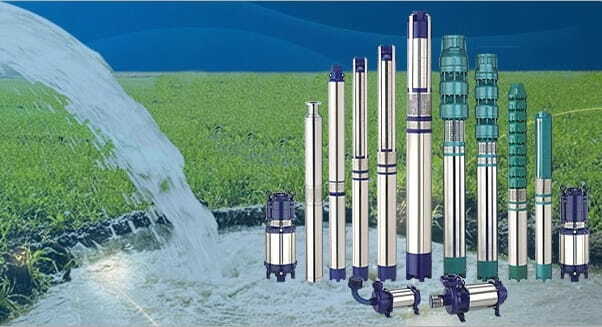 The company also have several variations available in their products. If you wish to try something different then you can purchase the Tandoori Mayo from the brand as well. Do give it a try before you try any other brand. If you are not very fond of eggless Mayonnaise and if you are looking for a Mayonnaise that is made by traditional way then we have something here for you. 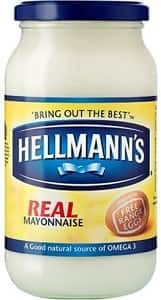 The Mayonnaise from Hellmann’s are made of eggs and not just some fats. This gives a better texture and taste to Mayonnaise and at the same time, it ensures that the Mayonnaise is packed with the goodness of the real ingredients. The eggs used to manufacture the Mayonnaise are free range eggs and hence it adds to the zest of the product. On the downside, the product is a little expensive because of all the goodness that is packed into the jar. Wingreens is not only a popular brand for Mayonnaise but it is known for many different dips. You have chilli sauce, cheese dips, hummus, tandoori sauce and many other things available from Wingreens which are surely worth trying. 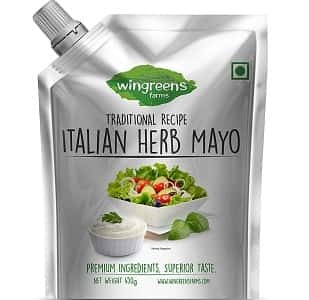 The brand is known for experimenting with flavor and some of the top-selling Mayonnaise flavors from the brand includes Wasabi Mayonnaise,Farm Mint Mayonnaise, Italian Herb Mayonnaise, Barbeque Mayonnaise and Farm Sirach Mayonnaise. These are some of the best flavors apart from the Garlic and Classic Flavors. 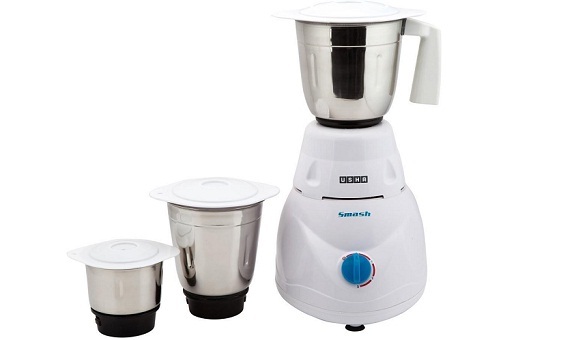 The price range is quite affordable and they are available in different packaging as well. On number 7, we have Posh Nosh. This brand is another condiment manufacturer which is again known for unique flavors. The products from the brand are vegetarian and they are made of natural ingredients which is surely a plus point for the brand. 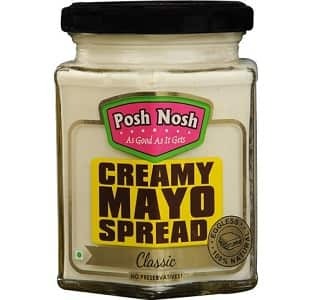 Posh Nosh also advertises of not using the preservatives in the Mayonnaise. You must try Sweet Chilli Mayonnaise from Posh Nosh and you will surely fall in love with Mayonnaise once you try this brand. Brand which doesn’t need any introduction is American Garden. 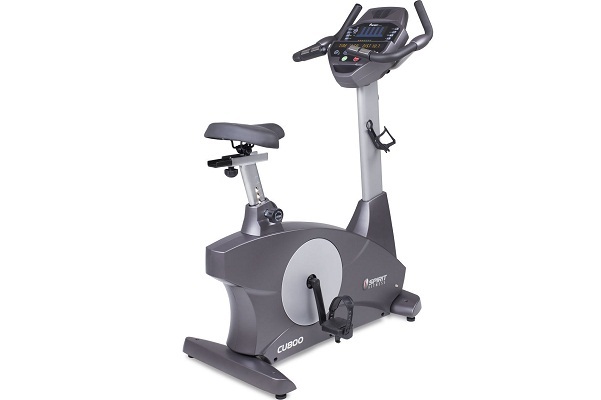 The products are not only made of high quality ingredients but they are also very affordable. Talking about the Mayonnaise from American Garden, you must know that the Mayonnaise is made of real eggs and at the same time, high quality standards are ensured. 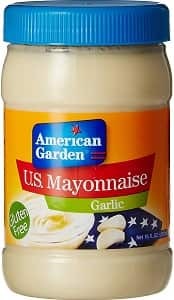 There Mayonnaise from American Garden is free from MSG. It is best to try the regular classic flavor from American Garden however, if you are diet conscious then you can even try lite version of Mayonnaise from American Garden. Next on the list is Sangi’s Kitchen. Just like other brands, it is not only into Mayonnaise but it also manufactures other sauce as well. 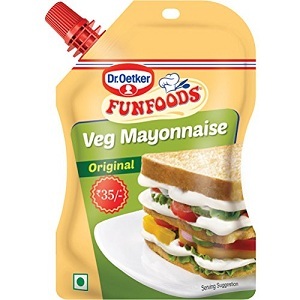 The Mayonnaise from this brand is 100% vegetarian and hence anyone can easily consume the product. 1 Kg packing of the Mayonnaise is easily available so that you do not have to keep ordering the small packages for consumption. It is surely one of the highly rated Mayonnaise available in Indian Market. You can even give a try to pizza and pasta sauce from Sangi’s Kitchen. FunFoods is one of the first brands which was made available in India and it has been in the country for over a decade. 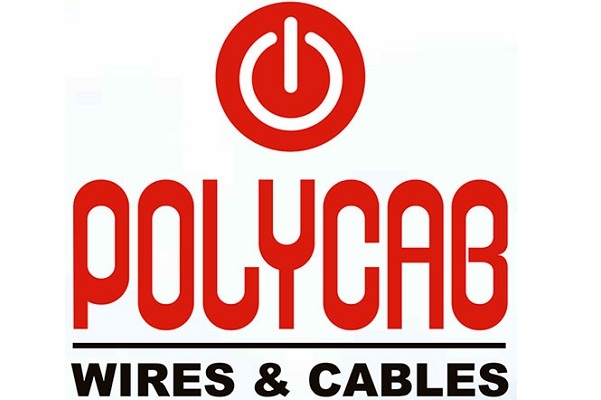 The company entered the market with a wide range of products and they were an instant hit. There is no question about quality as it is one of the most trusted and recognized brands for condiments. Apart from regular veg Mayonnaise, Tandoori Mayonnaise is another top-selling product from the brand which is loved by people of all ages. If you are looking for something different and something new then you can also give a try to Mayonnaise from Veeba. The brand has been in market for quite some time now and it has been winning hearts of children and adults by offering a flavor which is unique. The brand is known not only for Mayonnaise but also for different sauces. If you are fond of burgers then you must try the burger Mayonnaise from Veeba and you will forget about all other dressings for your burger. Del Monte is another popular brand available in India through retailers as well as through e-commerce. You can find different variants of Mayonnaise from Del Monte and this includes Eggless May, Cheesy Garlic Mayo, Mint Mayo, Egg Mayo and Tandoori Mayo. 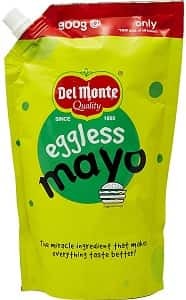 All the products are quite amazing but if you want a suggesting from us then you must try Cheesy Garlic Mayo of Del Monte and this is certainly the best offering from the brand. Talking about the best brand in India, it is Cremica and this is available in jars as well as easy travel package. 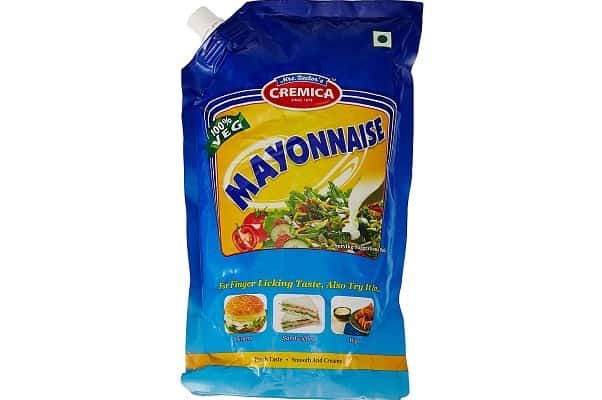 Cremica also has many flavors and variations in Mayonnaise which you can try. This includes Burger Mayo, Eggless Mayo, Egg Mayo and Lite Mayo for the diet conscious people. 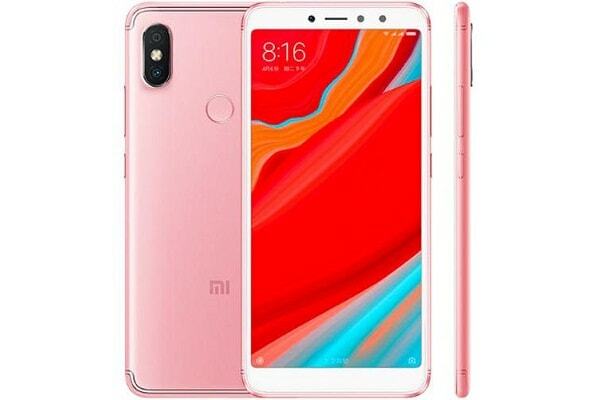 You can order this one from e-commerce sites and get the product delivered to your house. These are the top 10 best Mayonnaise Brands in India and there might be a case when you prefer a certain brand more than the other one. Hence, in this article, we have represented a general opinion about the brands and ranking. You can surely share the name of the brand that you love the most and do not forget to share the flavor that you like.